It’s been about 6 years since we lived near the southern Los Padres National Forest. 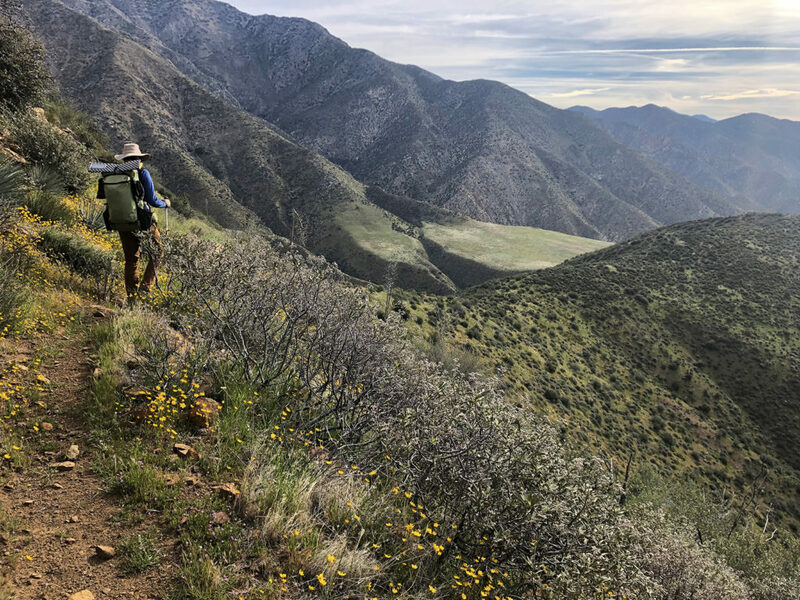 We were overdue for a vacation, so we decided to take a few days off work and pay a visit to one of our favorite hiking destinations: the Sespe Wilderness. The trail was pretty rough – not sure this was the most relaxing vacation – but it was good to get out. Elevation: Over 11,000 ft of elevation gain. Red Tape: A campfire permit is required for camp stoves and can be obtained here. There are no wilderness permits, quotas or fees for the route described in this post. If you are parking elsewhere in the Los Padres National Forest, a National Forest Adventure Pass may be required. Additional Information: The terrain is steep, rugged and unforgiving. Hazards include poison oak, rattlesnakes, ticks, bears and mountain lions. There is no cell phone reception and route finding may be difficult. Bring a map. 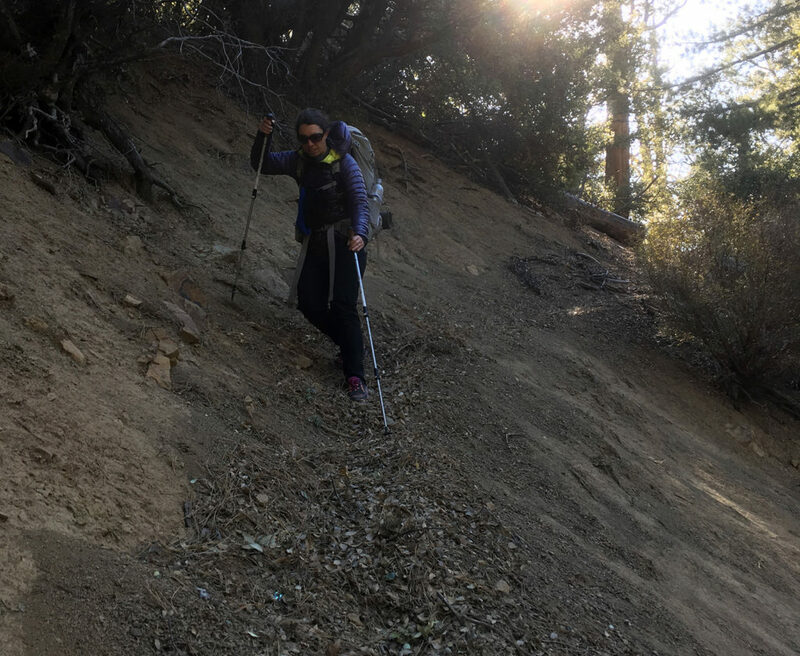 A great resource for trail information is Hike Los Padres. Additional information can be found on the USFS website. 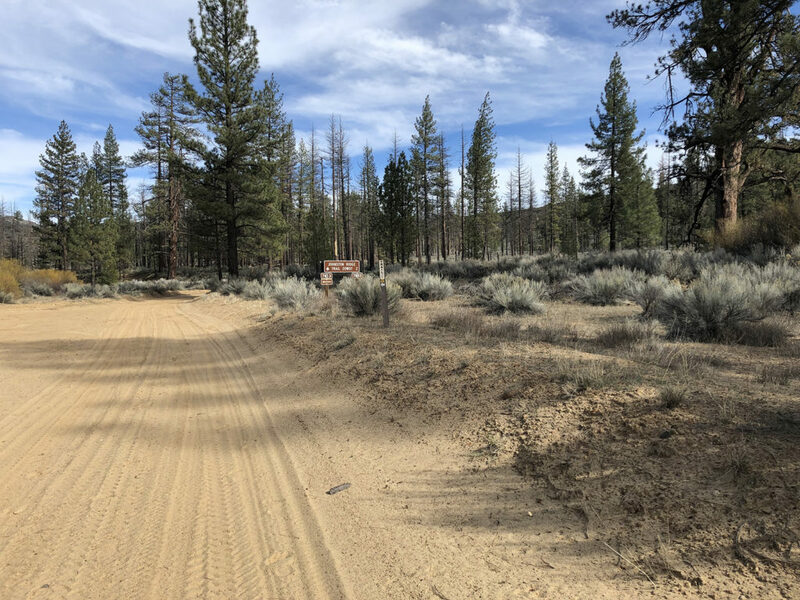 The Reyes Creek trailhead is located beyond the Reyes Creek Campground loop, off Lockwood Valley Road near Highway 33. The Google Map directions led us somewhat astray. From Highway 33, proceed 3.5 miles along Lockwood Valley Road to Forest Rte 7N11. Turn right and proceed another 2 miles to the parking lot. Follow signs for Reyes Creek campground and trailhead. Google Map link to trailhead. 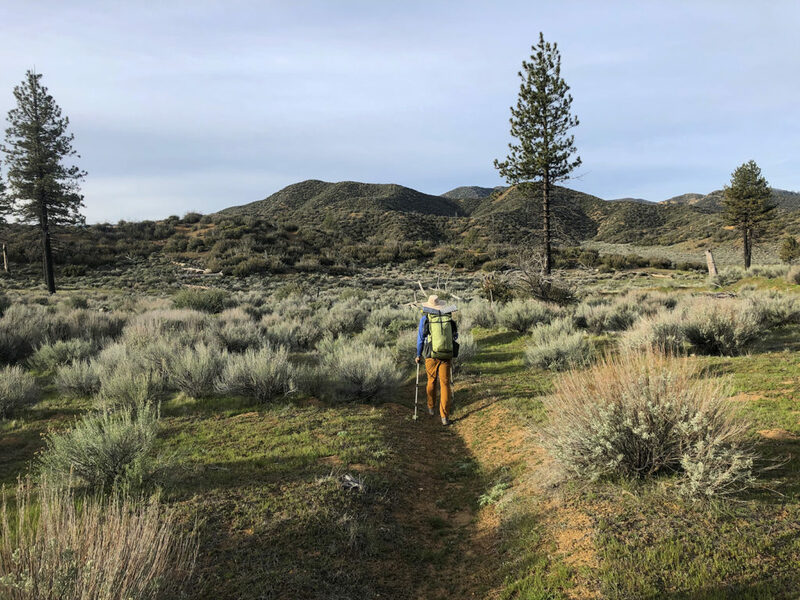 We looked at various routes in the Sespe Wilderness – there are a lot of options. Rob called the USFS ranger station to ask about leaving a car parked on Lockwood Valley Road. The ranger suggested we hike in to the wilderness from the Reyes Creek trailhead. Seemed good enough, so we planned out a 60+ mile loop beginning at Reyes Creek. The route would take us up the Gene Marshall trail to Pine Mountain Lodge, then along the Cedar Creek Trail towards the Thorn Point area. From there, a road walk to the Johnston Ridge trailhead. 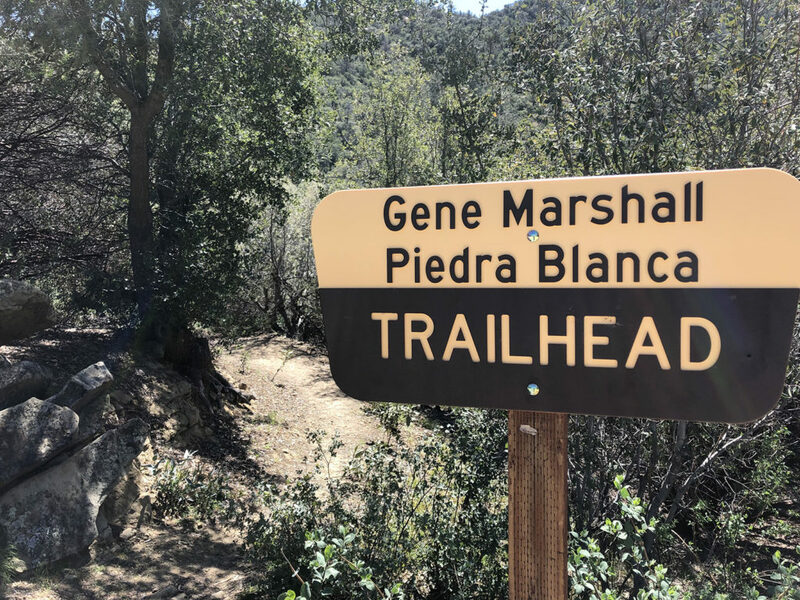 Then down to Sespe Hot Springs, and from there, follow the Sespe River Trail back to the Gene Marshall Trail at Piedra Blanca and ultimately back to Reyes Creek Trailhead. After a 5 hour drive, we reached the trailhead at midday. We ate lunch, shuffled gear and were hiking before 2 p.m. The trail mostly climbs from Reyes Creek up to Haddock camp. 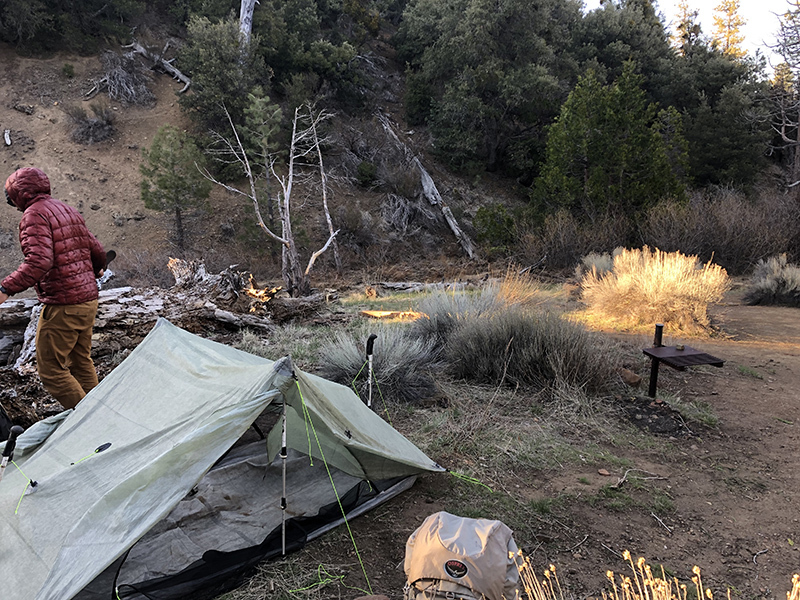 There are a couple other trail camps along the way: Upper Reyes (3 miles in) and Bear Trap (4.7 miles in). Sections of trail between Bear Trap and Haddock were difficult to follow. The trail parallels a creek, but it seems a large flash flood came through at some point and wiped out portions of trail. We had a little trouble, but eventually found our way. 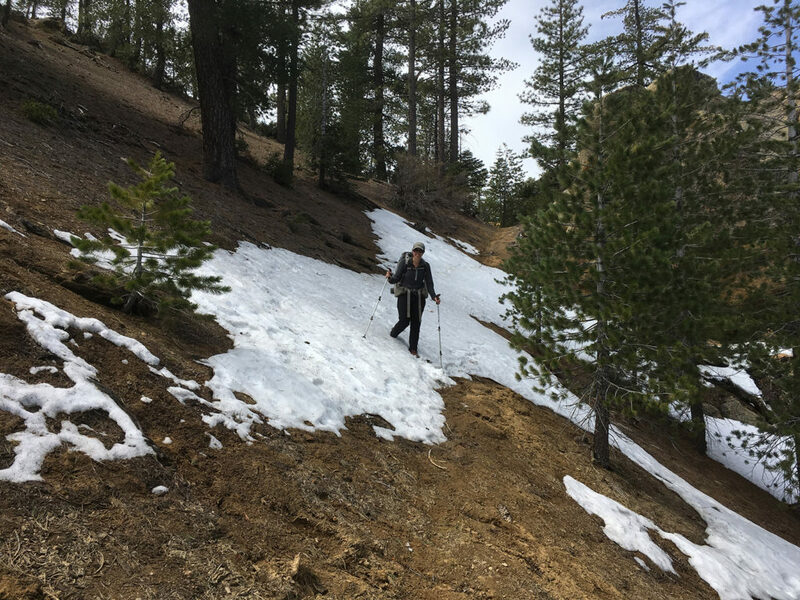 Before climbing up the final ridge to Haddock, we came across another backpacker who warned us that some 30+ Boy Scouts were camped at Haddock. We wanted to avoid a crowded campsite, so we found a tent site off the trail, high up on a ridge, about a half mile before Haddock. As we left our campsite, we came across the 30+ scouts as they hiked out to Reyes Creek. From Haddock, it’s 2 miles to the next trail camp called Three Mile (go figure), and another 1.8 miles to Pine Mountain Lodge. Pine Mountain Lodge is a trail camp, not a lodge. This was the site of a cabin about a hundred years ago, but the Forest Service accidentally destroyed the cabin while felling a tree sometime in the 1950’s or 60’s. At Pine Mountain Lodge, the Gene Marshall Trail splits off, and the Cedar Creek Trail leaves directly from the trail camp. We followed the Cedar Creek Trail, first up to 6600’, then down along a ridge to the trailhead at 4820’. This trail has nice views and seems better maintained than the Gene Marshall Trail. The Cedar Creek trailhead is on Forest Service Road 7N03B. 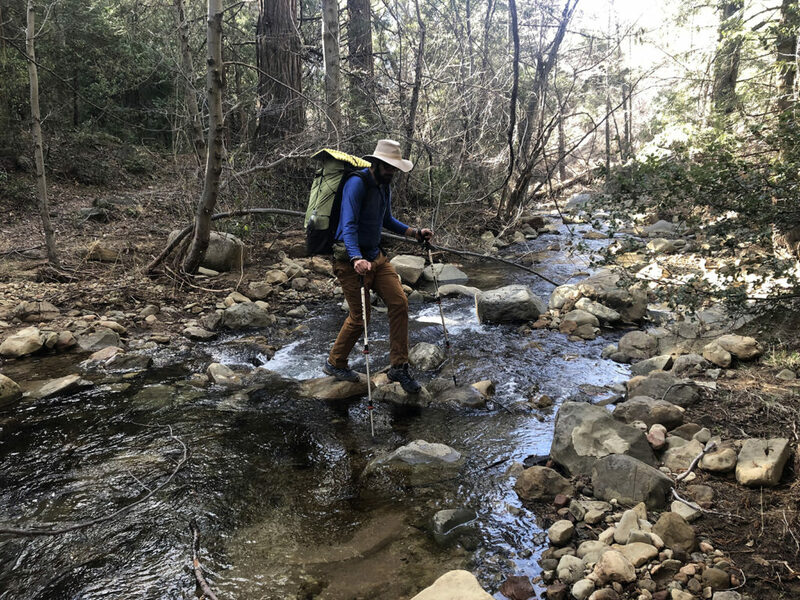 When we reached the trailhead, we left the Sespe Wilderness and began walking along the forest service road. The access gate for this road (off Lockwood Valley Road) was still closed for the season, so even though it was the weekend, no one was around. 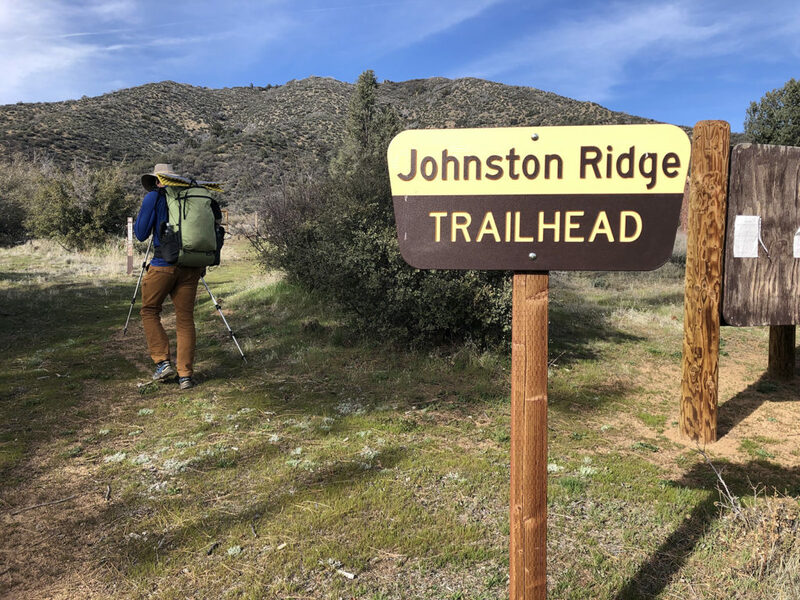 We followed the road, turning at a junction to go east toward Halfmoon Campground and the Johnston Ridge Trailhead. When we reached the trailhead, it was deserted. After a quick stop, we continued on the Johnston Ridge Trail. 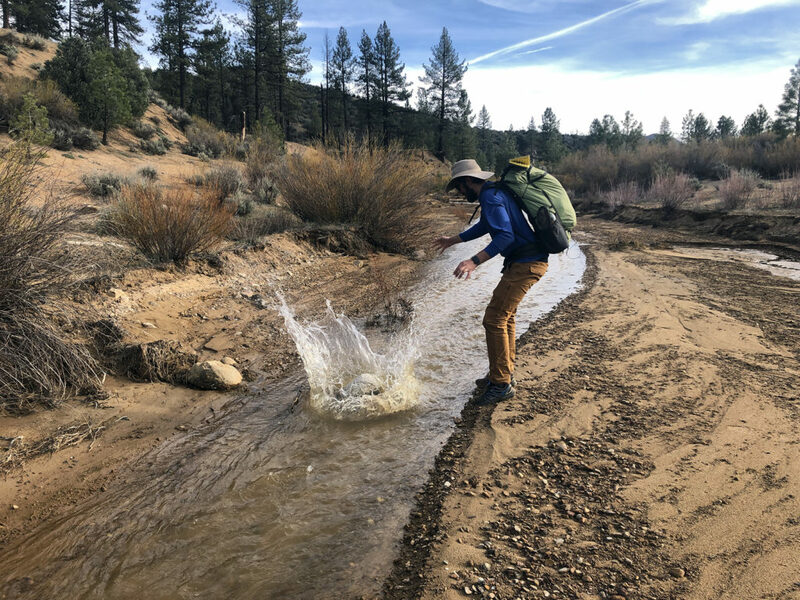 Throwing a stepping stone into Mutau Creek. 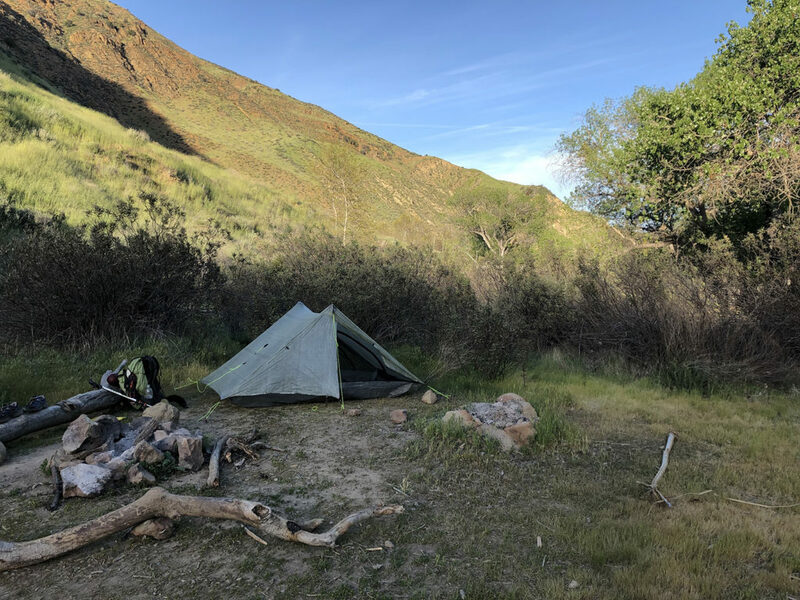 I wanted to get back into the Sespe Wilderness before setting up camp. We skirted the edge of Mutau Flat (a private parcel adjacent to the wilderness) and filled up on water in Mutau Creek. 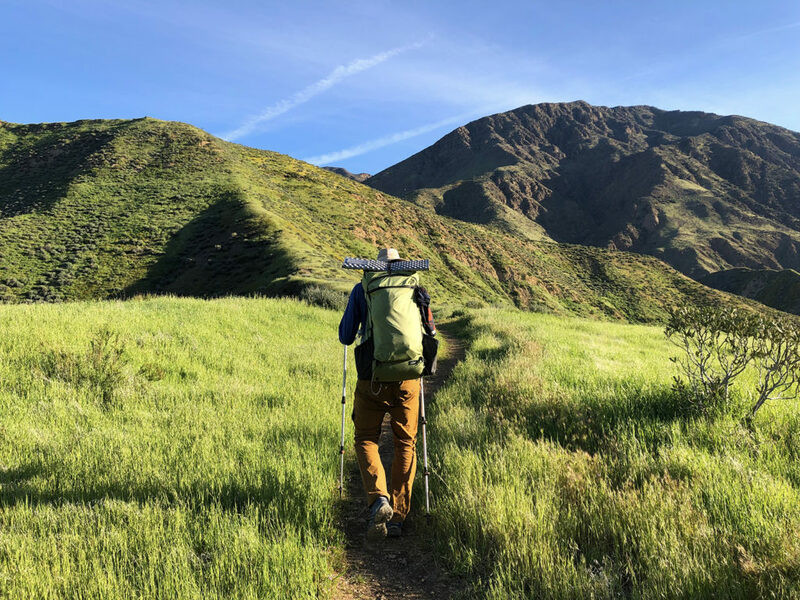 The trail climbs up a chaparral covered ridge before making the long descent to Sespe Hot Springs. Somewhere near the high point, we left the trail and found a flat tent site for the night. 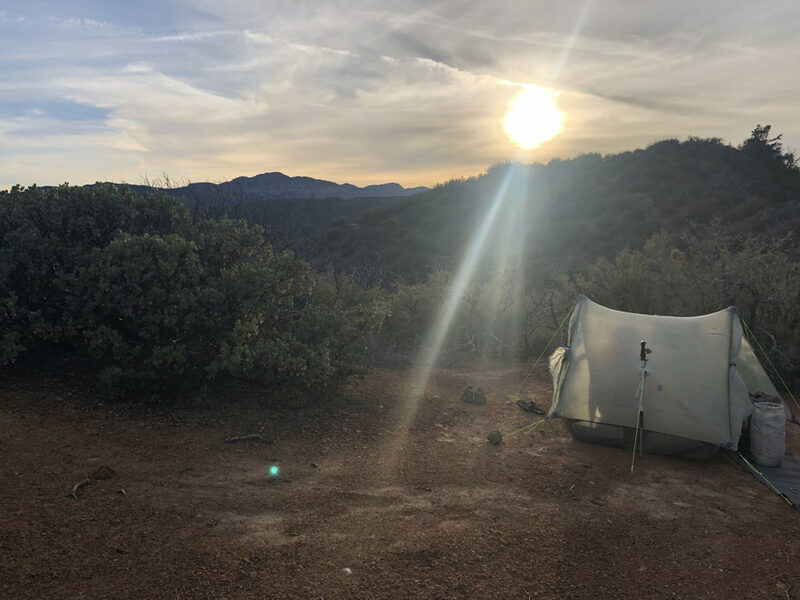 Camped on the ridge amongst the chaparral. We were up with the sun and on the trail before it got too hot. 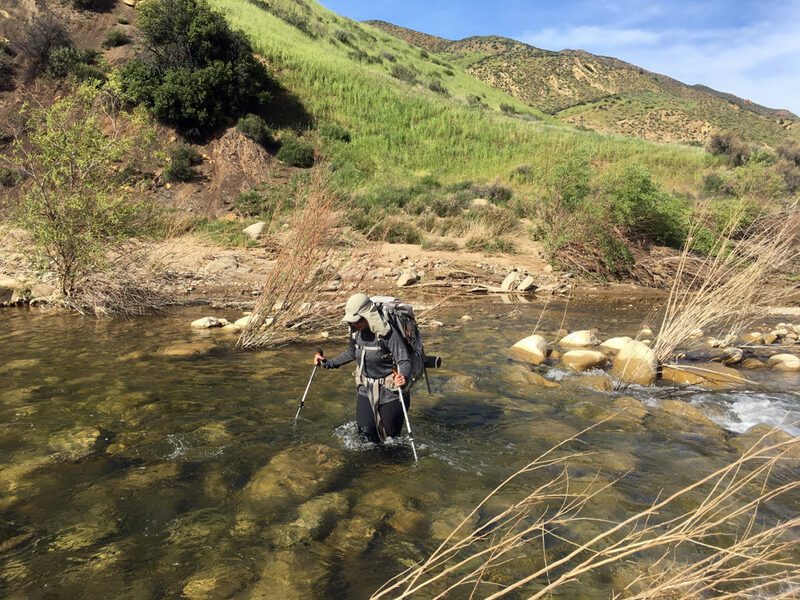 The descent to Sespe Hot Springs is only 6.2 miles, but it feels long. We got rattled at by a large rattlesnake on our way into Hot Springs Canyon. 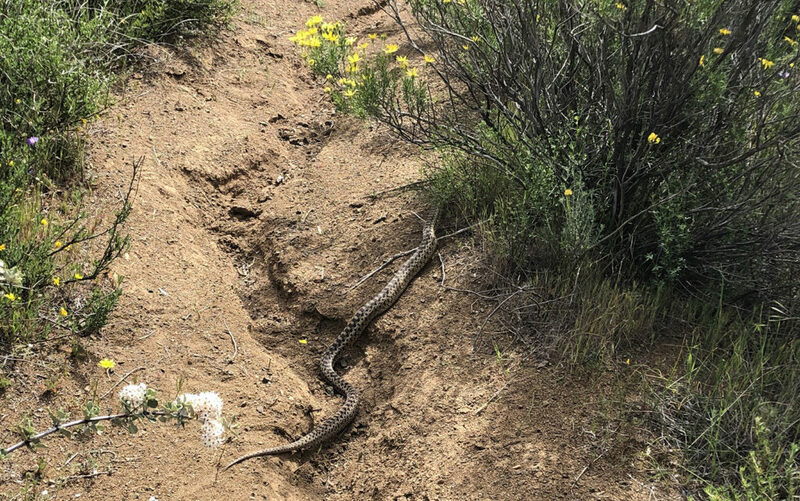 I didn’t get a photo of the rattlesnake because I just wanted to get away from it, but here is a gopher snake on the trail. Looking down into Hot Springs Canyon. When we reached the canyon floor, we dropped our packs and wasted no time exploring. The water coming out of the hot spring is too hot to touch. I know this because I accidentally stuck my foot in one of the hotter streams dribbling down from the cliff. Yeow. A creek, originating somewhere above the spring, mixes with the hot water, then flows down through the canyon. 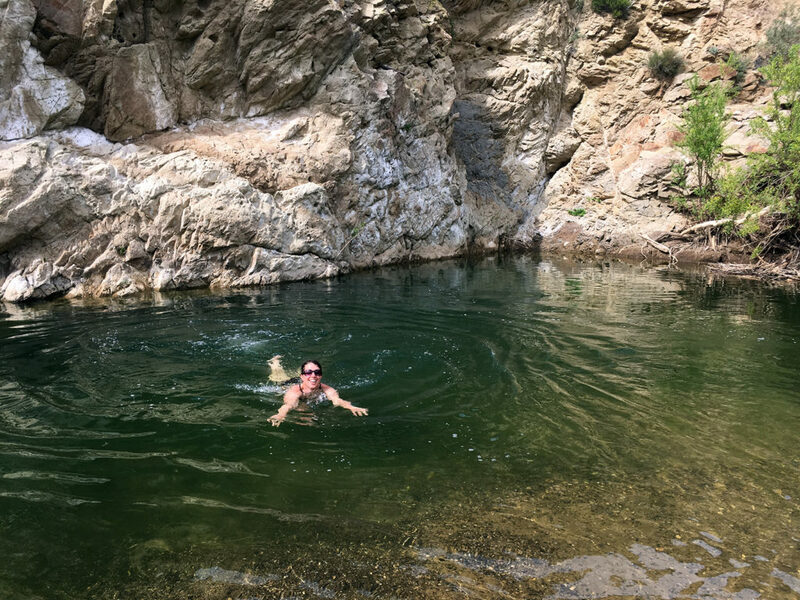 The entire creek is warm and various pools have been built up along a half mile stretch of canyon. 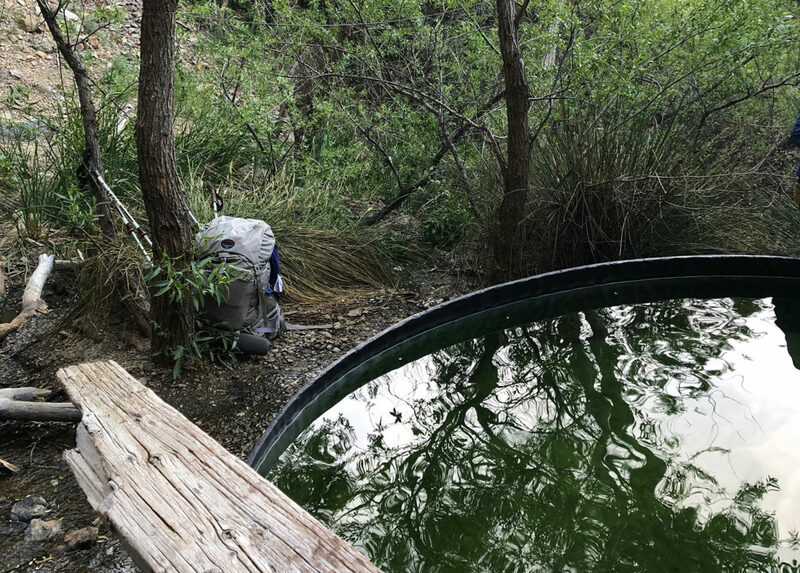 Deep pool in the warm creek. Eventually, the day got a little too warm for warm water to be enjoyable, so we sat in the shade and ate lunch. We decided not to camp there; we’re too restless to sit around for a whole afternoon. So after lunch, we filled up on water and hiked down the canyon to the Sespe River Trail. We were rattled at by another snake as we left the canyon. 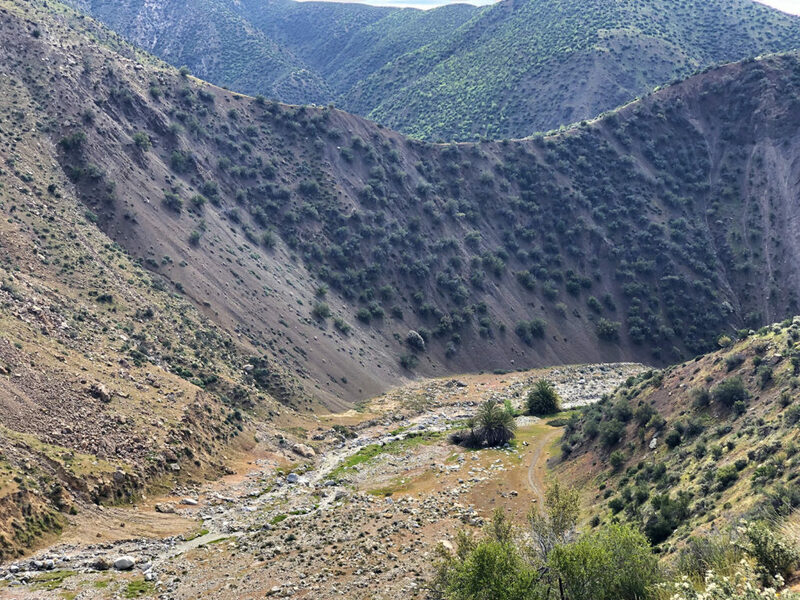 The trail crosses Sespe Creek several times before reaching Willett Hot Springs. The day warmed up so we stopped to swim in the river. We eventually made it to Willett Hot Spring sometime in the evening. This is a popular backpacking destination, but with it being a Monday, there were plenty of available campsites. Only a few other people were around. 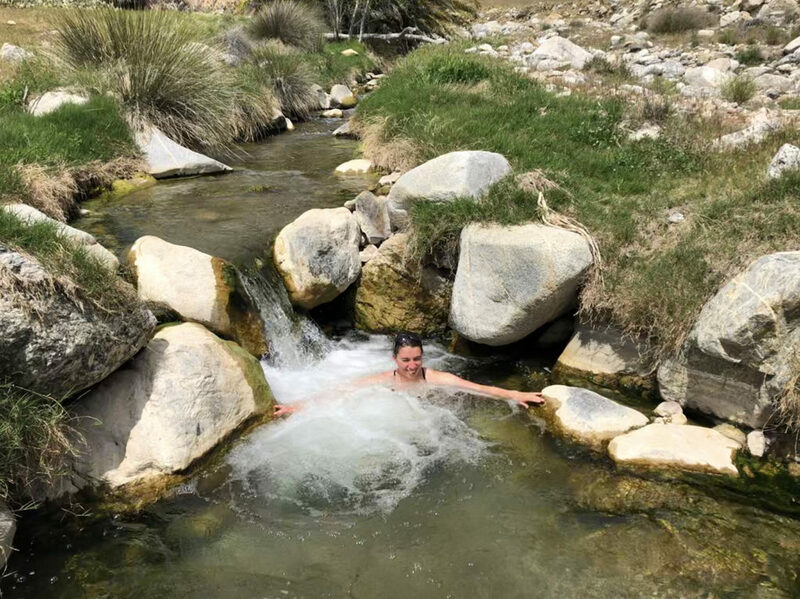 The hot spring is located high up in a canyon above the Sespe. We climbed up and jumped in before setting up camp and making dinner. We woke up early and were on the trail around 7 a.m. to beat the heat. 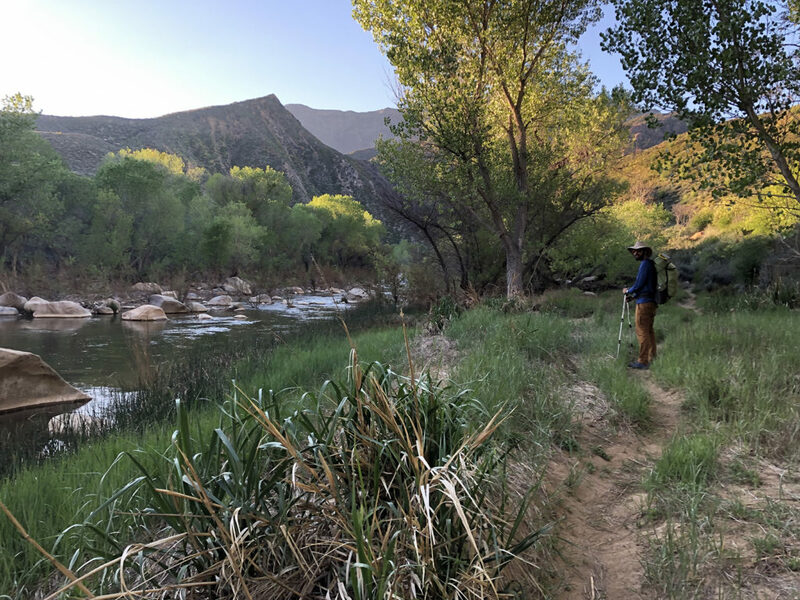 The Sespe River Trail is quite scenic in some parts and the miles went by relatively quickly. Leaving Willett early in the morning. Around lunch time, we reached the junction with the Gene Marshall Trail. We saw a number of people in the morning, but as soon as we started up the Gene Marshall Trail, we were once again alone. We passed Piedra Blanca, the white rock formations near the trailhead. The five miles between Piedra Blanca and Pine Mountain Lodge were kind of horrible. The trail climbs 3000 feet. It’s overgrown and tick infested. We kept having to stop to pull ticks off our clothing. The lower portion of the trail has quite a bit of poison oak. The upper portion has sections that go straight through landslides, with the narrow path barely clinging to the side of the cliff. It’s also incredibly steep, so trying to rush past the less stable sections left us completely out of breath. 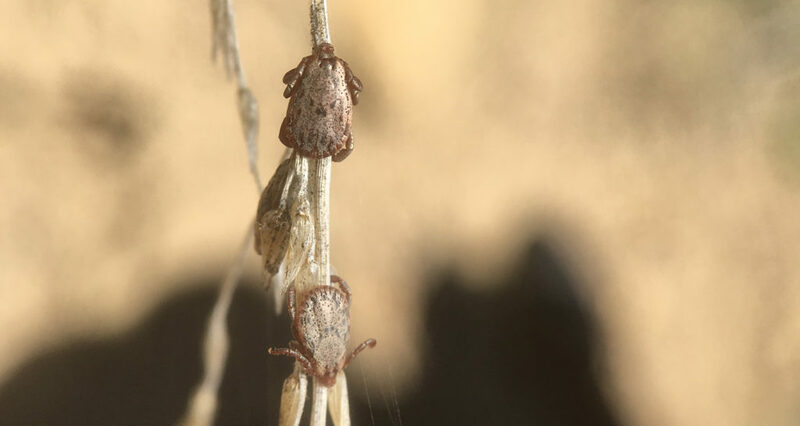 Macro shot of two ticks. They were EVERYWHERE. As we climbed higher, the wind began to pick up. By the time we reached Pine Mountain Lodge, it seemed we were in for a big windstorm. We set up our tent and ate dinner inside it. The night was not restful. Gusts of wind violently shook the tent. A stake holding up one of the main tent poles ripped out of the ground more than once. The wind racing through the trees sounded like a jet engine. Sometime during the night I decided that I would never go backpacking again. We woke up with dust on our faces and frost on our sleeping bags. The mesh on our tent did not block the dust that the wind kicked up, even with both doors closed. The wind was still howling so we heated water for coffee inside the tent. Our battered tent the morning after the windstorm. 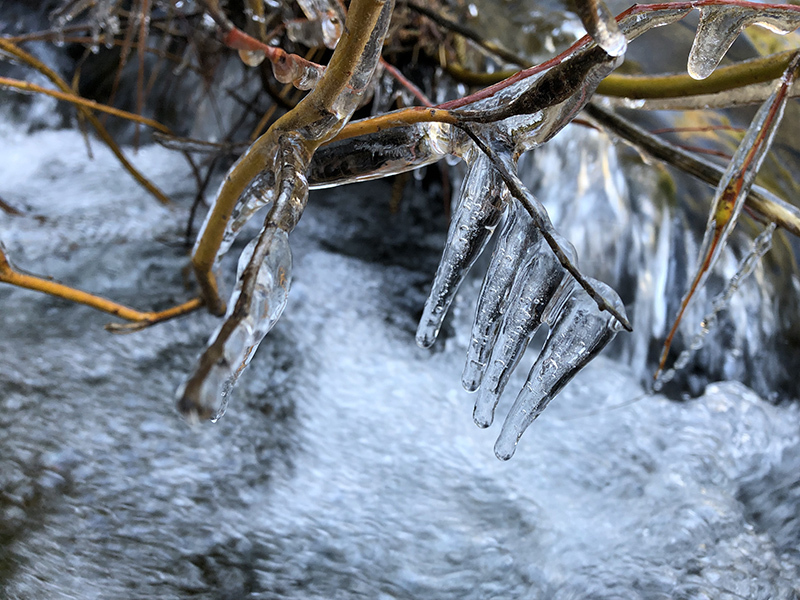 Ice in one of the creek crossings on our way out. 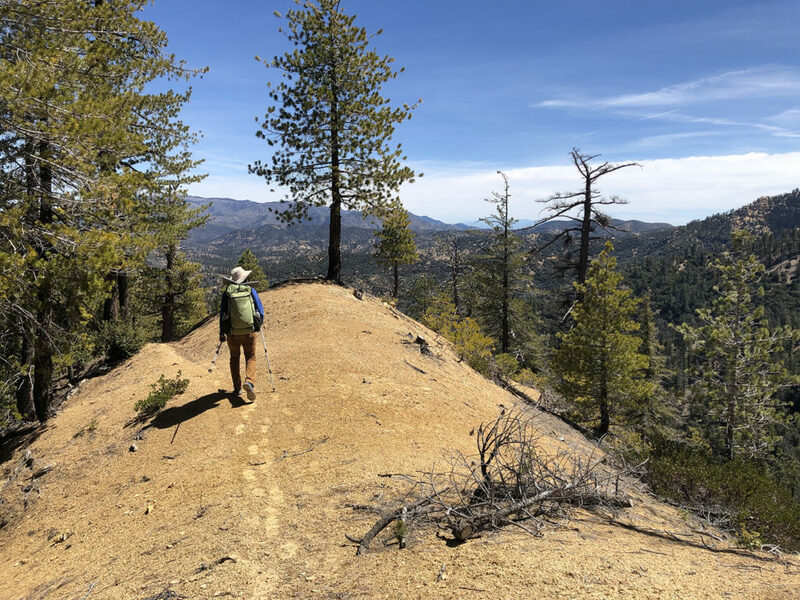 We packed up quickly and hiked out along the Gene Marshall Trail – the same way we had come in – making it back to the car around 2 p.m. We stopped for a burger at In-N-Out on the way home. We rarely eat fast food, but that burger really tasted good. I will probably go backpacking again.